March 19, 2015 ~ Sara W.
I don’t know how one grows to feel unworthy of love and belonging. I don’t think there is some statistic that ties such a thing to something like “being breast fed versus bottle fed” and, if there was, I wouldn’t believe it anyway. You can’t isolate feelings of unworthiness down to one source, so I see no point in trying to figure it out. But, sadly, I am a victim of believing myself unworthy of love and belonging. I can say with certainty that these feelings were felt long before any diagnosis of depression or Bipolar II Disorder. Before you go worrying about me, I know in theory I am worthy of being loved and accepted. Most of us know that in theory, right? Also, I don’t want people worrying that I grew up without “I love you” and support from my family, because I did have all of that. Again, I don’t know the source of these feelings, but the fact is that I somehow have deemed myself unworthy of love and belonging. The scariest part of coming to terms with how I feel about myself is realizing that, based on our last argument, my daughter appears to be having a similar view of herself. My daughter was able to articulate herself in such a way that I knew the source of her words had to do with her feeling unworthy of love and belonging. While I don’t go blaming my parents for my feelings of unworthiness, I certainly blame myself for my daughter feeling this way. I don’t know if that’s unfair or justified for me to do so, but if my eight-year-old feels like less than enough, then I cannot separate myself from that. Now the question is, what do I do with the knowledge that my daughter and I are facing a similar struggle of believing we are unworthy of love and belonging? There are several points that Brown makes in her book The Gifts of Imperfection , but I think a big one for my eldest daughter and myself is that we confuse guilt and shame. If I boldly reprimand my daughter, her instant response is to cry out, “I’m a bad person!” or “I’m the worst kid ever!” Mind you, I have said nothing about her character in my disciplining nor any such thing about her being a bad person or child. I merely pointed out that she didn’t listen or that she made a bad choice. She is the one that turns it into, “I’m a bad person.” I am quick to correct her about the difference between shame (I am bad) versus guilt (I did something bad). The interesting part is that I find it so absurd that she takes my disciplining and turns it into a five-alarm situation of self-loathing. But, guess what? I do that too. I don’t cry out with wailing and gnashing of teeth, but I sure as heck go to my room and tell myself what a horrible person I am for yelling at my daughter. Then to make sure I really give myself the proper punishment, I begin to tell myself all the other aspects of life that I am horrible at. I am a horrible wife, because I don’t prepare dinner. I am a horrible at-home Mom, because my children watch too much TV. I am a horrible friend, because I don’t serve others enough. I am horrible with finances, because I like to eat out. You get the idea. I’m really good at this self-loathing thing. Well, well, well, looky there! I just gave myself a compliment. At least we know I’m good at something – shaming myself. Here’s the best part – I just had this epiphany of the similarities between my daughter and I while I was typing this post. That’s how blind I’ve been to hers and my struggle. I recall my therapist trying to teach me the difference between shame and guilt years ago, because she saw that my confusion between the two was having a damaging affect. I didn’t understand how I was mixing the two up in my daily life nor did I grasp the negative affect it was having on my emotional wellbeing, until now. I understood the difference in theory, but I did not understand their difference in practice. Does that even make sense? It’s the same thing with feeling worthy. I logically understand that, as a person, I am worthy, but I don’t feel worthy. Just like I get the difference in the definitions between guilt and shame, but I don’t recognize when I am mixing the two up in my daily life. I honestly did not get it until this very moment. ::mind blown:: I am behaving in the same absurd manner as my daughter is when she takes my discipline and turns it into believing that she’s a bad person. I throw the same fit. I just do it in a more controlled manner and somehow I’ve convinced myself that that is okay. Oh my gosh! I now get why my husband gets so frustrated with me when I share my self-loathing with him. He sees how absurd it is for me to believe myself a bad person for having made a mistake in a particular moment. He knows better. So, is confusion between shame and guilt the only cause of feeling unworthy? No. But it certainly doesn’t help my situation if I’m turning my mistakes into a blanket statement of me being an awful person. It’s no wonder I feel unworthy of such love and belonging. Woah. This is a lot to process. I guess the first step would be to catch myself in the action and teach myself to separate shame and guilt. My husband is always good about stopping me in my tracks when my self-loathing begins, but he’s not always with me. He simply says one line, “Put the phone down,” to get me to stop speaking negatively about myself. His line is in reference to the fact that he once told me that my self-loathing is like having Satan on speed dial, calling him up, listening intently as he whispers all these terrible things about me, and then foolishly believing him. So when I get going on my laundry list of reasons why I am “less than,” my husband quickly tells me to, “Put the phone down.” It works every time. I can be redirected, because in theory I know I am worth being loved. The breakdown occurs when I’m alone with my thoughts, I pull up my speed dial, and suddenly Satan and I are catching up on old times. I know that I am loved and accepted. I’d like to believe that my daughter knows she is as well, as I try to show her often and tell her regularly. However, she and I both seem to have some miscommunication between what we know and what we feel. As a mother to this special little girl, I’ve struggled greatly with knowing how to raise her when I feel like I haven’t even figured myself out. How do you teach a child about self-esteem when you seem to have so little regard for your own? How do you teach a child about healthy living, when you struggle with proper diet and exercise? I don’t know the answers to these questions. My only hope is that open communication with her about my weaknesses and imperfections will help her to realize we are all imperfect individuals, but we are also beautiful and incredible people trying to do our best. Perfection and worth are exclusive of one another. I do not have to be perfect to be worthy of love and belonging. The sooner I can learn to separate the two, the sooner I can help my daughter on her path. 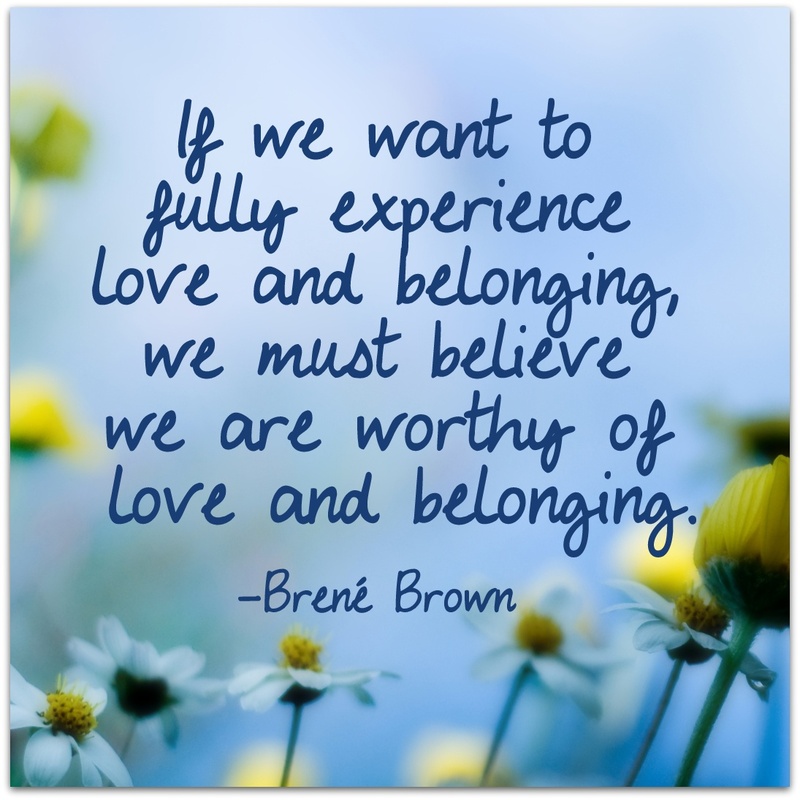 We are all worthy of love and belonging, when we believe that in practice, and not just theory, we will free ourselves up to fully experience those same beautiful emotions. This is an incredible post, Sara. Thanks for articulating so very well how many of us feel about ourselves. It is so helpful to know I am not alone in my parenting and self-worth struggles.